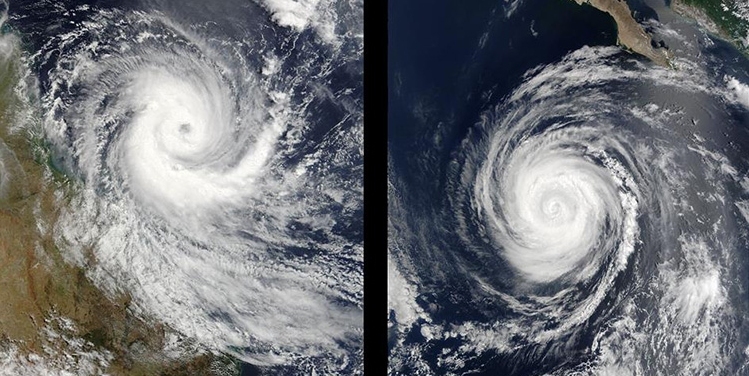 Cyclone Larry near northeast Australia (left) and Hurricane Hernan near Mexico (right). Notice that the rotation in the Southern hemisphere is clockwise, and the rotation in the Northern Hemisphere is counterclockwise. When I see it, I generally comment that the video is a clever con. It is based on a scientific concept that is quite true, but it does not apply to situations that involve short distances. Most of my Facebook “friends” express appreciation for me pointing out the error, but one of them was adamant for a while that the video shows a real truth. In my efforts to educate him, I ended up finding a really nice video resource, which I will share after my long-winded statements on this issue. The picture at the top of the post illustrates a general trend in nature. Hurricanes and cyclones in the Southern Hemisphere rotate in a clockwise fashion, while hurricanes and cyclones in the Northern Hemisphere rotate in a counterclockwise fashion. This is because of the Coriolis effect, which is a consequence of the earth’s shape and its rotation. The earth is a sphere, and it makes a full rotation every 24 hours (not exactly, but that’s okay). Since all parts of the earth have to return to where they were 24 hours previously, the land at different latitudes actually travels at different speeds (relative to the center of the earth). The land at the equator has to travel farther to get back to its original position than the land near the poles, so the land is actually moving faster (relative to the center of the earth) at the equator than it is at the poles. As objects (or gases) rise from the ground, they have the speed that the land has, so objects moving in the air near the equator are moving with the land faster than objects moving in the air far from the equator. Because of this, the path of things that travel away from the equator appears to bend. If I fire a missile north from the equator, I am giving it a northern velocity, but it also gets an eastern velocity because the land is moving east with the earth’s rotation. At the equator, that eastern velocity is high, so the missile travels north because of the velocity I gave it, but also east because of the high velocity the land gave it. Once it is in the air, the land doesn’t push it anymore, so it continues to travel with a high eastern velocity. The land underneath the missile travels east more slowly the farther north the missile goes, so the missile ends up “outrunning” the land, and its path bends east. If you have a hard time visualizing that, here is a good website that has a great animation. If I now shoot a missile south, the same thing happens. Its path bends east, because it has a faster eastward velocity than the land over which it is traveling as it heads south. So both missiles bend east. However, when I am standing at the equator and looking north, east is to my right, so I see the missile I shot north bending to the right. When I stand at the equator and look south, east is to my left, so I see the missile bending to the left. Now look at the storms above. Notice the clouds in the Southern Hemisphere (Larry) bend left from the center of the cyclone, while the clouds in the Northern Hemisphere (Hernan) bend right from the center of the hurricane. So tropical storms rotate clockwise in the Southern Hemisphere and counterclockwise in the Northern Hemisphere. That’s what leads to the myth in the video shown above. If tropical storms do it, then water in a basin should do it, right? Wrong! This effect only works when the distances are long enough for there to be a noticeable difference in the speed of the land. A basin doesn’t cover enough distance to have a noticeable difference in the speed at which the land is traveling. If you see the first video pop up in your Facebook feed, please leave the second video in the comments! It’s address is https://youtu.be/pdMZjssrAlk. Apparently they repeated the experiment 3 times and had the same result each time. Unless there’s something else going on here, it seems based on this that the Coriolis effect is still visible in small basins, and it’s mainly the shape of the basin and the initial movement of the water that negates the effect rather than the size of the basin? Notice what the Veritasium guy says at around 4:05. He talks about the great lengths he had to go to to see the effect and that it won’t be seen in a sink or a toilet. That’s because you need a large enough size (the kiddie pool is apparently large enough) for the difference in speeds to be noticeable. Does Water Swirl the Other Way in the Southern Hemisphere? It’s not just Facebook, this is a common myth that’s been around for as long as I can remember: water in toilets in the Southern Hemisphere swirls in a different direction than toilet water in the Northern Hemisphere. I’ve been to New Zealand a few times, and upon returning home I’m often asked if I’ve observed this phenomenon. The problem is that toilets in New Zealand function differently than toilets in the US. Whereas toilet bowls in the US first fill up with water (which is disgusting) and then the water goes down, toilets in NZ simply shoot the water straight down without filling the bowl. Point being, that toilet water in NZ doesn’t swirl! Needless to say, I’ve never observed this “phenomenon”, primary reason being I have better things to do than watch my excrement float around in a circle! I’ve always prefered the NZ toilets, and I think this type of toilet should be fully utilized in the US, as they are both more effective and less discusting. As a joint Australian / New Zealand citizen, I agree with you completely that the USA loo design is disgusting. It doesn’t help that the EPA ecofascists have outlawed loos from using enough water to make them work properly, so every loo has to have a plunger nearby. Ah, it’s the EPA’s fault that US toilets are retarded! Good to know. Too bad they haven’t yet realized that if you have to flush a toilet twice you waste a lot more water! While they’re at it, why don’t they go ahead and outlaw keeping taps and showers on for more than 10 seconds at a time! btw, Dr. Sarfati, I played chess against you (along with 11ish other people simultaneously) in Lynchburg, Virginia at the Creation MegaConference back in 2005. I’m pretty sure I was the first one to lose. So how exactly are they manipulating the water in the first video? I notice that the man seems to pour the water toward the directional arrows in north and south hemispheres, and at the equator you can see the flower start to spin right before it gets sucked down. Was that the trick, that he’s manipulating the water by pouring in the direction of the arrows? For the different hemispheres, I think you are right. He is pouring the water to give it the directional flow he wants. As the last video shows, that motion is retained, even if you let the water settle. For the equator, it looks like the bottom of the basin is flat and the basin is not as deep. That helps to minimize the vortex. I can’t say for sure unless I was there and I was allowed to pour the water, but that’s my best guess.